You should consult with your doctor after 1, 3, 6, 9 and 12 months once your hypertension is detected. An ECG should be done every time you visit your doctor. After 6 and 12 months, along with ECG, some more tests like 2D Echo, fasting blood sugar, serum creatinine, lipid profile, and micro-albumin needs to be done. Weight Management Maintaining an Ideal Weight is crucial as obesity is a big risk factor for hypertension.Even losing 5 kilos can reduce blood pressure (BP). Calculate your Body Mass Index (BMI) here and aim to keep it below 23. Physical Activity A moderate intensity workout lasting 30 -60 minutes daily can help lower BP and also help maintain a healthy weight. Alcohol is high in calories and known to increase blood pressure. Talk to your doctor to know more about how much alcohol can be consumed. Tobacco and second-hand smoke as it can lead to other cardiovascular diseases (CVD). Call - the Quit Line, 1800-22-77-87. Stress can increase BP. Incorporate a daily routine to relax and rejuvenate - try to listen to soothing music, chant, read a book or meditate. To avoid the state of hypertension and high BP, it is necessary to combine positive dietary and lifestyle changes with the recommended medications. 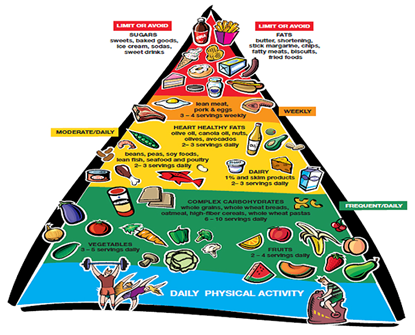 Typically, food items can be classified into six major groups as shown in the Healthy Heart pyramid. Include lots of fresh, seasonal, local and if possible organic Fruits and Vegetables. Choose foods high in Good Fat such as olive oil, peanut oil, fatty fish, walnuts, flax seeds. If you do not eat fish, talk to your doctor about taking fish supplements like cod liver oil capsules. Say NO to all Sugary beverages and foods. Do not add any extra sugar to beverages like tea coffee etc. Especially if you are diabetic. Refined ingredients like white rice, white flour, maida should be completely omitted from diets. Especially if you are diabetic. Avoid combination of sugary and refined foods like cakes, pies, ice creams as they do the most harm. Especially if you are diabetic. Avoid Unhealthy Fats such as Cholesterol, Saturated and Trans Fat. Stay away from egg yolks, cream, butter, ghee, coconut, deep fried items, whole milk, dalda, vanspati. No Carbonated, Caffeinated and Alcoholic beverages. Check portion sizes for each food by going to these links. (9),(10) Do not add SALT or SUGAR while cooking or as seasoning. For cooking, use only Olive oil or Peanut oil. Maintain a balanced diet and perform regular physical activity. Eat foods that are low in saturated fats and cholesterol. Avoid foods high sodium content. If overweight or obese, loose the extra kilos and maintain a healthy weight. Quit smoking and cut down on alcohol. Check your blood pressure regularly.